People over fifty might remember well the panorama of heavy living room, kitchen and bedroom cupboards, with weighty pseudo-Baroque decorative excesses expressing all the pride of petit-bourgeois comforts. 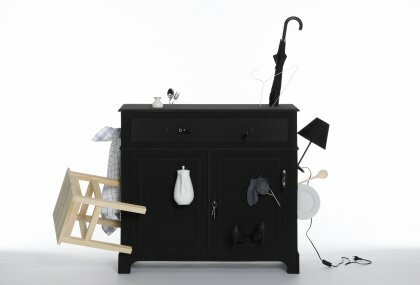 Silvia Knüppels Drückeberger (Shirker) shows that people in their thirties are still well aware of this chapter in German domestic design. Looking from a distance, her wardrobe looks instantly like a prototypical successor to these old times. 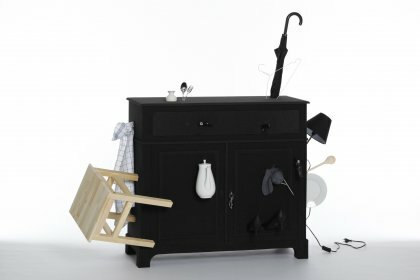 On closer inspection, however, it becomes clear that it is not one of these monsters but a very sophisticated and highly contemporary version of the genre of furniture. The designer presents a massive block of foam, with only the cuts indicating that it is to be used as a receptacle for all kinds of household goods. In a very unconventional way, Knüppel proposes putting clothes and books, and anything you like, into slashes in the foam  which is certainly a clearer arrangement than allowing things to disappear into the depths of the flourish of "Gelsenkirchen Baroque".